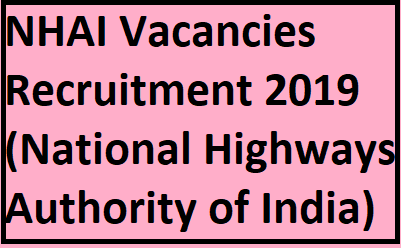 nhai vacancies recruitment 2019 - Government Jobs, Sarkari Naukri, Sarkari Result, Admissions, Rojgar, Exams Alerts. Manager:- Degree in Commerce/Accounts from a recognized university or ICAI/ICWAI/MBA (Finance) from a recognized University/Institute OR Member of any organized Group-‘A’ Finance/Accounts related Services of the Central Government or of the State Government and 4 years’ experience in the Pay Scale of Pay Band-3 (Rs. 15,600- 39,100) with Grade Pay Rs. 5400/- or equivalent or higher and have 4 years’ experience in Financial Accounting/Budgeting/Internal Audit/Contract Management/Fund Management/ Disbursement in an organization of repute. Accounts Officer:- Degree in Commerce/Accounts from a recognized university or ICAI/ICWAI/MBA (Finance) from a recognized University/Institute OR Member of any organized Group-‘A’ Finance/Accounts related Service of the Central Government or of the State Government and At least 4 years’ experience in Financial Accounting/Budgeting/Internal Audit/Contract Management/Fund Management/ Disbursement in Central Government or State Governments or Union Territories or Public Sector Undertakings or Semi Government or Statutory or Autonomous Organizations and other Governments Bodies. 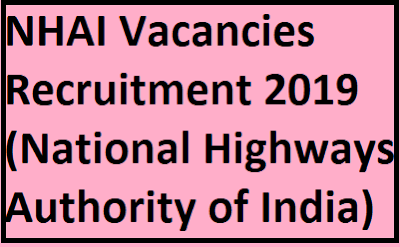 Duly filled-in applications, along with the requisite information/documents stated in above paras, may be sent by Registered/Speed Post, through proper channel wherever applicable, to the Ajay Malik DGM (HR&Admn. )-IB Plot No: G – 5&6, Sector – 10 Dwarka, New Delhi – 110075, so as to reach latest by 27.05.2019.